Heat oven to 375°F. Unroll dough onto ungreased 15×10-inch cookie sheet; press dough in bottom and up along sides of cookie sheet. Bake 8 to 10 minutes or until light golden brown. Remove from oven; cool 5 minutes. Meanwhile, in 10-inch skillet, cook and crumble ground beef over medium-high heat until no longer pink; drain. Set aside. Spread refried beans in partially baked crust. Spread cooked beef evenly over beans. Top beef with tomato and green onions. Sprinkle crushed tortilla chips evenly over tomato and onions. 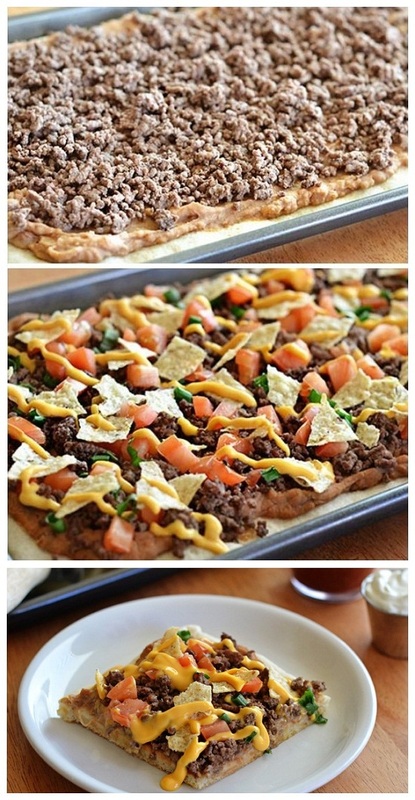 Drizzle nacho cheese sauce all over top. Return to oven; bake 8 to 10 minutes longer. Cool 5 minutes before cutting and serving.